Horned Grebe, Podiceps nigricollis. Grebe. Say it out loud. It's a strange word. Try saying "grebe" with an Igor sort of voice, or do your best Ren imitation and try saying it. What is a grebe? Where did the word come from? I wanted to find out its origin. But after a little research, it seems know one quit knows what the word means, or where it came from. 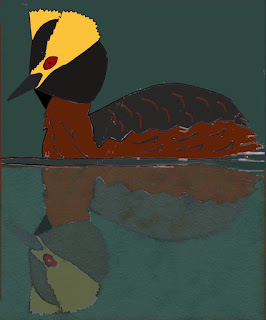 Various sources gave a vague reference to the word "grebe" having a French origin and perhaps meaning "comb". I consulted a number of older books and articles on birds, when authors were much more verbose in their bird descriptions, hoping to find a better explanation for the name, but no luck (though I did come across this interesting article from 1919 issue of the Auk about bird popular names which also mentions grebes). Other names for the Horned Grebe include Hell-diver, Water-witch, Devil-diver, Pink-eyed Diver, and Dipper. Which all sound pretty cool. Some could even be super villain names ("Holy Hell-diver Batman!" "Right Grebe-boy").